Explore the amazing nature of Kagoshima. Enjoy the grand view of Sakurajima volcano and lava cliffs from the water on a tandem kayak tour with an experienced guide. You may touch and feel hot spring in the ocean and sometimes meet dolphins from a kayak. Individuals (two at minimum), groups and families are all welcome and no experiences required. Please send us the reservation request form. Let us know the type of the tour, date of the tour, the number of participants, names, ages and gender of each participant. Notice：Please inform us the number of participants who weigh more than 90 kg. We will send you back an email to confirm your availability. 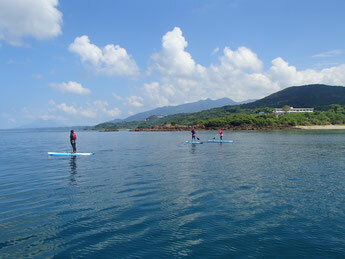 Do you want to try to stand up paddle? Qualified guides are here for you. Let us know the type of tour, date of the tour and the number of participants, names, ages and gender of each participant. Notice：The maximum weight of a participant is 100 kgs. 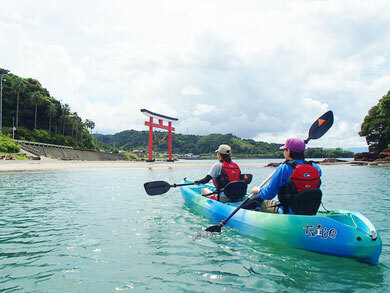 PADDLERS provides Sea Kayak, River Kayak, Canoe, SUP, Paddling School, Expedition and Outdoor Activities at Kagoshima, Sakurajima, Kanoya, Kinko Bay, Oosumi and others.